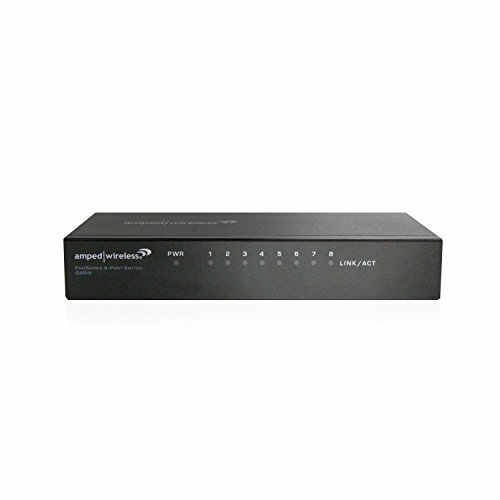 The Amped Wireless Pro Series 8-Port Gigabit Switch adds an additional eight wired devices to any network and at gigabit speeds. The G8SW is built to be an efficient work horse for any network. With the rugged metal enclosure it can perform flawlessly in extreme temperatures and is also built with Amped Green, an advanced power saving feature for energy efficiency. All of this ultra-fast and reliable data transmitting is packed into a compact casing, making it a discreet addition to any desktop or cabinet. Ultra-Fast Gigabit Connections: Connect up to 8 devices at gigabit wired speeds for maximum performance and reliability. Amped Green: Energy Efficient Design: Use less energy with Amped Green, an advanced power saving feature that allows for less power consumption during periods of low activity. Compact Design: Place it where you need it. The G8SW is compact in design, making it a discreet desktop or cabinet device.